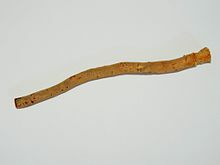 The miswak (miswaak, siwak, sewak, Arabic: سواك‎ or مسواك) is a teeth cleaning twig made from the Salvadora persica tree (known as arāk, أراك, in Arabic). It is reputed to have been used over 7000 years ago. The miswak's properties have been described thus: "Apart from their antibacterial activity which may help control the formation and activity of dental plaque, they can be used effectively as a natural toothbrush for teeth cleaning. 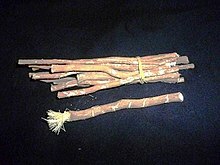 Such sticks are effective, inexpensive, common, available, and contain many medical properties". It also features prominently in Islamic hygienical jurisprudence. The World Health Organization (WHO) recommended the use of the miswak in 1986, but in 2000 an international consensus report on oral hygiene concluded that further research was needed to document the effect of the miswak. Some of this further research has been done on a population of 203, and concluded, in turn, "that the periodontal status of miswak users in this Sudanese population is better than that of toothbrush users". Yet another comparative study conducted on a sampling of 480 Saudi Arabian adults found that "the level of need for periodontal care in the sample chosen is low when compared with the findings of similar studies undertaken in other countries. The frequent use of the 'Miswak' was associated with a lower need for treatment". A 2016 paper has been published comparing human DNA left on used miswak and toothbrushes, including the effect of time, to determine whether miswak is a reasonable source of DNA when found at crime scenes. The conclusion was that miswak contains a high enough quantity of DNA, and retained good DNA profiling; and when compared to toothbrushes, miswak is a reasonable source of DNA for forensic profiling. In addition, time of storage up to 4 months had no or little effects on results. Mouthrinses containing chlorhexidine was with maximum antibacterial activity, while cetylpyridinium chloride mouthrinses were with moderate and miswak extract was with low antibacterial activity. However, the benefits of triclosan were discounted by the United States Food and Drug Administration in 2016 and its safety is uncertain as a hygiene product ingredient. Chlorhexidine gluconate was also linked to serious allergic reactions, albeit rarely. The use of the miswak is frequently advocated in the hadith (the traditions relating to the life of prophet Muhammad). Situations where the miswak is recommended to be used include before religious practice, before entering one's house, before and after going on a journey, on Fridays, before sleeping and after waking up, when experiencing hunger or thirst and before entering any good gathering. Were it not that I might over-burden the Believers I would have ordered them to use Siwak (Miswak) at the time of every Prayer. Four things are from among the practices of the Prophets: Circumcision, Perfume, Miswak, and Marriage. Make a regular practice of Miswak for verily it is the purification for the mouth and a means of the pleasure of the Lord. A miswak should be one hand span in length when selected. If it becomes dry, it should be soaked in any water to soften the end bristles. The end should be cut afresh to ensure hygiene and should never be stored near a toilet or sink. The brush may be created by cutting Salvadora persica's branches instead of its roots; keeping in mind that the tree's roots can retain moisture more so than its branches. This favors more long-term usage. Many companies offer special cases for carrying miswak. Many of these companies also produce miswak itself. The main purpose of these cases is to protect and carry miswak in order to preserve its freshness. Plastic toothbrush cases are available at most drug stores and may be used for carrying a Miswak. ^ Ra'ed I. Al Sadhan, Khalid Almas (1999). "Miswak (chewing Stick): A Cultural And Scientific Heritage". Saudi Dental Journal. 11 (2): 80–88. ^ Al lafi T, Ababneh H (1995). "The effect of the extract of the miswak (chewing sticks) used in Jordan and the Middle East on oral bacteria". International Dental Journal. 45 (3): 218–222. PMID 7558361. ^ "Darout, Ismail Abbas, Undersøkelse av en aktuell eldgammel munnrengjøringsmetode, dr.odont., disputas: 23.06.2003". www.uib.no (in Norwegian). ^ Darout, Ismail A.; Albandar, Jasim M.; Skaug, Nils (January 2000). "Periodontal status of adult Sudanese habitual users of miswak chewing sticks or toothbrushes". Acta Odontologica Scandinavica. 58 (1): 25–30. doi:10.1080/000163500429398 – via Taylor and Francis+NEJM. ^ Alfadaly, N., Kassab, A., & Al Hedaithy, F. (2016). Determination of DNA profiling of siwak and toothbrush samples used in Kingdom of Saudi Arabia. Egyptian Journal of Medical Human Genetics, 17(4), 383-387. ^ Almas, K. (August 2002). "The effect of Salvadora persica extract (miswak) and chlorhexidine gluconate on human dentin: a SEM study". J Contemp Dent Pract. 3 (3): 27–35. PMID 12239575. ^ a b Almas, K; Skaug, N; Ahmad, I. (February 2005). "An in vitro antimicrobial comparison of miswak extract with commercially available non-alcohol mouthrinses". Int J Dent Hyg. 3 (1): 18–24. doi:10.1111/j.1601-5037.2004.00111.x. PMID 16451373. ^ Commissioner, Office of the. "Consumer Updates - 5 Things to Know About Triclosan". www.fda.gov. Retrieved 2017-09-23. ^ Commissioner, Office of the. "Safety Alerts for Human Medical Products - Chlorhexidine Gluconate: Drug Safety Communication - Rare But Serious Allergic Reactions". www.fda.gov. Retrieved 2017-09-23. ^ "الرئيسة - الحديث - موقع الإسلام". hadith.al-islam.com. 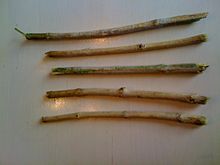 ^ "Excellence of Miswak in Hadiths" at ziaetaiba.com. ^ a b c IslamKotob, Muslims and "Science", (Islamic Books), p.30. ^ Farouk, Muhammed. "Miswak/Sewak". www.islam.tc.